What do you think would happen when the promulgator of lives set it’s foot in Capricorn, the earthly element and one of the four cordial signs. Capricorn has lord Saturn instilled as the house lord, which although shares a rocky relationship with it’s father ( planet Sun ), yet brings auspiciousness this transit. Have a go at our blog and know how this entertaining planetary relations, climatically effects every zodiac sign. 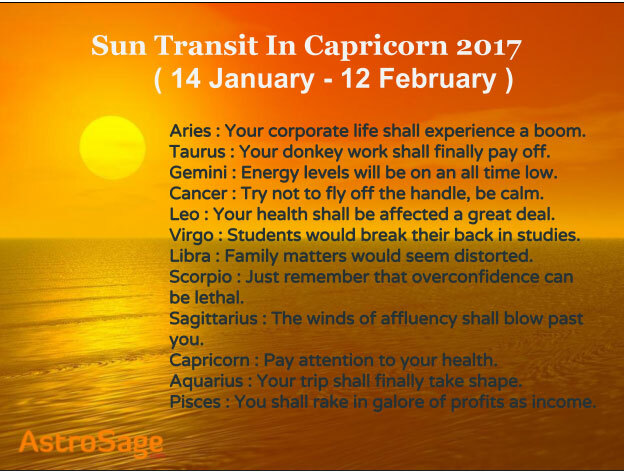 Wait for the magic to unfold as Sun make its way to capricorn on 14 January 2017, at 07:38 am. It shall remain in that arrangement till 12 February 2017 at 08:37 pm.